Your favourite stationery store with more, Smiggle is bursting with games and toys, gadgets and gizmos that will surprise and delight on Christmas morning. This year Smiggle is making Christmas even merrier, with its usual touch of glitter, sparkle and fun, at prices that range from pocket money picks to big ticket items! 1. 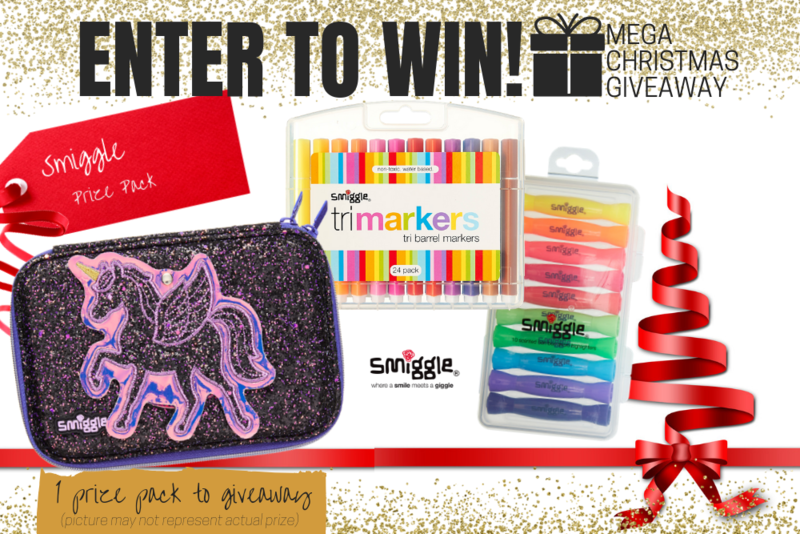 **Smiggle Gift Pack - including Glitzy Mirror Hardtop Pencil Case $29.95, Tri Barrel Markers 24pk $24.95 and Bonbon Highlighters $12.95. Total Prize Value $67.85** AUD (the "Prize"). 2. It is the responsibility of the winner to collect the Prize within 7 days of the end of the Competition Period from the Promoter’s Mornington office. 3. The Prize, or any part thereof, must be accepted as awarded and is non-negotiable, non-transferable to another person and non-convertible and is not transferable for cash. 4. The prize must be collected from the Promotors Mornington Office, unless otherwise advised.